Get ready for some real dining challenges. Old Don Tano back today with what be a dangerous subject, so I hope you’re adult enough to be cautious when you get to Palermo. I’ll tell you the top street food specialties to try. Hey, I’m not talking about the Mafia. Those guys won’t bother you. I’m gonna tell you about some of the best (you’ll see why it’s dangerous) street food to be found anywhere. I mean this stuff can turn a normally well-bred civilized person into a ravening wild and fierce lion. 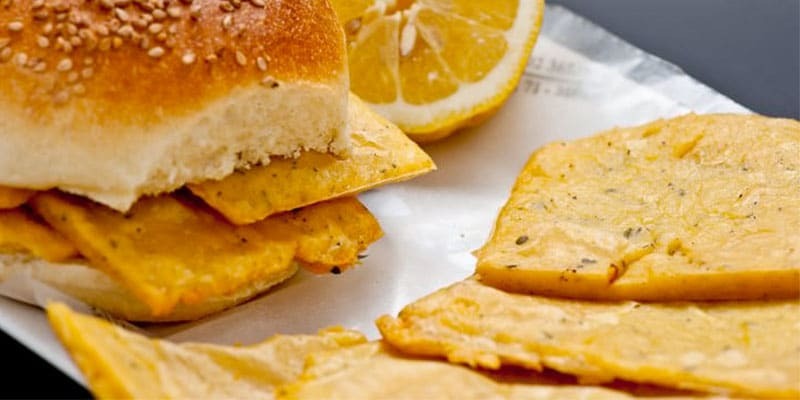 Yes, I’m gonna make you froth at the mouth as you read over seven of Palermo’s most traditional and popular snacks that form an integral part of our varied Sicilian culinary culture. I’m gonna write down the best and not-to-be-missed dishes you absolutely have to try when you get to Sicily. Keep the list on your tablet or in your pocket or handbag. Once you hit the streets of Palermo, keep an eye out for a shop or stand that’s on your list. Actually, you probably don’t even need a list because your nose will lead you in the right direction. Now, this isn’t gonna be a list for sissies who want to lose fifty pounds on some diet program that promises that the more you eat their “delicious food” the more weight you lose at the same time. I admit, these dishes aren’t gonna help anybody lose weight, but they’re gonna add a lot of satisfaction to your stomach, I can promise that! You may be able to cart that extra weight off to heaven when you go, but Sicilian street food? I’m afraid you can’t take that with you. It has to stay right here in Palermo, so think about it. In the streets of Palermo, you’re gonna find simple street food that promises to give you the maximum calories for the minimum cost. This food is cooked fresh right on the spot and any of the food stalls you’re gonna find on just about every street. All these guys need is some sort of cart, usually metal, to carry their “kitchen” around with them. The kitchen consists of a simple grill and some copper pans. But you won’t believe what these street chefs can do with such simple equipment…and they do it right before your eyes. 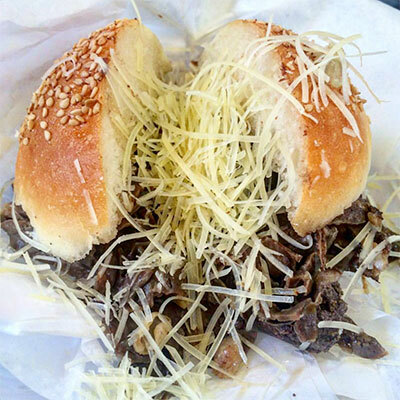 Where do you find Street Food in Palermo? My list doesn’t cover every dish you may find on your excursions around Palermo, but this list is my personal favorite for the street foods no civilized person can live without. Weighing in at about three and a half inches in diameter (about 9 cm) this fried ball of rice will really get you. You might want to know what these rice balls contain, but without a police science lab in your pocket, you’d never figure it out. The Arancina is also called the Arancina Bomba, reaching nearly twice the size of the regular Arancina. Arancina is the only food with its own patron saint, Santa Lucia. On December 13, local Sicilianos don’t eat pasta or bread for religious reasons, but they can go ahead and gorge on Arancina creating a profound genetic mutation that lasts until well past Christmas. The mutation I mention is that they genetically mutate into “Arancina con i piedi”. In English, this means they turn into Arancinas with feet. Sometimes eager eaters (and beer drinkers. too) get those enormous bellies. So calling them Arancina con i piedi seems proper. Here it’s not really an insult and most people get a laugh out of it. I have to say that although Arancina is nominally a fried ball of rice, every version I’ve ever seen contains some sort of meat, so if you’re a vegan, be warned. Maybe you should just stay away. Most stalls or cafés offer two traditional toppings: Carne (Bolognese, a meat-based sauce) and Burro a béchamel sauce with cheese and ham. Both are well worth a try. When we were children, a rosy-faced chubby priest sometimes invited us as guests to his countryside home. There, we were fed like cattle being fattened up before being sent to our slaughter. We ate until we simply had to stop. I felt like getting on my knees and praying that God would not allow me to explode. And just at that precise moment, our cheerful priest opened the door to the refrigerator and brought out a beautiful cake. Most Sicilians, I think, have this common idea stuck in their heads. 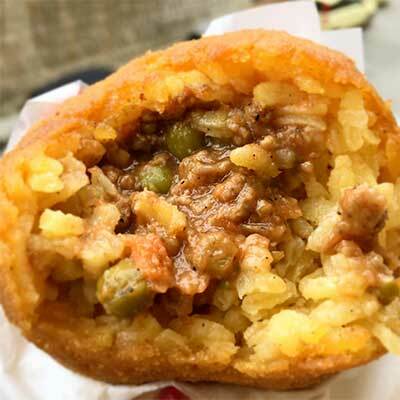 That can explain why on every street corner of Palermo you’re gonna find street food like Arancina and Panino con le Panelle among the most popular and readily attainable. 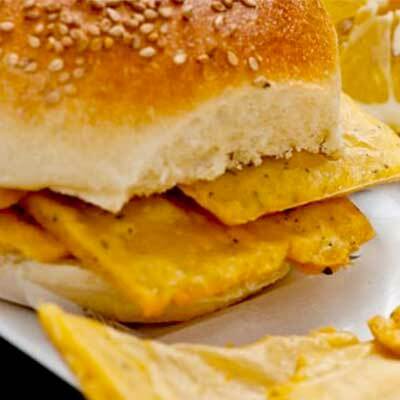 Panino con le panelle are crisp fried chickpea fritters on soft sesame-seeded buns. Vegans and people on big diets can eat them without the bread. Sometimes they only squeeze a bit of lemon over the top. Aside from the above, there are really too many to mention. Pane con le milza (aka pani ca meusa in Sicilian) translates to a sandwich stuffed with spleen of veal. It looks a lot like a good old American hamburger. I didn’t say ‘tastes like’; just ‘looks like’. Yes, among the other mysterious ingredients you won’t be able to identify in your sandwich, a major ingredient is spleen of veal, along with lung and trachea. Now, we all have a spleen which some claim in a vastedda tastes something like chicken liver. Others have widely varying opinions. It’s something you have to try once. I mean, it won’t kill you. Many say the flavor is too strong, but this sandwich is really very tasty. When lung, trachea and spleen of veal are cooked together over low heat in copper pans with diet-busting lard, you’ll become a believer. Unlike the panelle, pane con la milza can’t really be eaten without the bread. You can add lemon squeezed over the sandwich to ease the punishment your stomach may encounter. The Pani ca meusa comes in two versions. Schietta means single and only contains the above-mentioned ingredients. The Maritata (married) adds flakes of ricotta cheese on top. One of the more famous places to eat pane con la milza is Porta Carbone. Cars and trucks normally form a complete traffic jam in front of the shop while they vie with the others to get their hands on a spleen sandwich before setting out for their day’s work. This ritual consists of having a pane con la milza before getting behind the wheel to start their journey. When I consider the time, from about seven to nine every morning, I can’t really speak about breakfast but the courage it takes to get up there and get a sandwich to down before heading out to work takes some real manly courage. Another traditional Sicilian street food called Frittola or Frittula, is kept in a “Panaru”(a wicker basket covered with a cloth napkin. This keeps the temperature high. 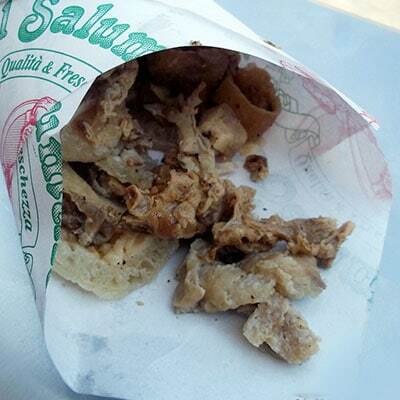 If you’re game enough to request a Frittola, the vendor dips his hand beneath the napkin and comes out with a handful of greasy-looking, mysterious product which he or she hands to you on oiled paper. Again, this is one of Sicily’s ongoing mysteries: the contents hidden beneath a cloth in a basket. Most educated guesses run to pieces of meat, lard and cartilage all boiled down for some time and then finally, browned in lard. (All over the world, good cooks agree that, while lard is not a high recommendation for those on a strict diet, it is, however, the first choice for good flavor. American apple pie just isn’t the same without a crust made with lard. Frites can’t really be the same drenched in safflower oil or other substitutes, so please don’t think we Sicilians are “strange” for preferring lard over everything but olive oil and butter. Zio Totò (Uncle Totò), a street vendor nearly as old as Don Tano has been selling Frittola since I was a child. He works from a movable three-wheel Ape Piaggio (A sort of three-wheel covered motorcycle/pickup truck or van for commercial use in crowded narrow European streets). For many years now Zio Totò has been a fixture in Old Town. He was old even when I was young I often bought Frittola from Zio Totò. Now I’m old too, but he still looks the same. Another of life’s imponderable mysteries. Frittularo (A street vendor of this dish). They are to be found all over Palermo. Get ready to look disturbed again. 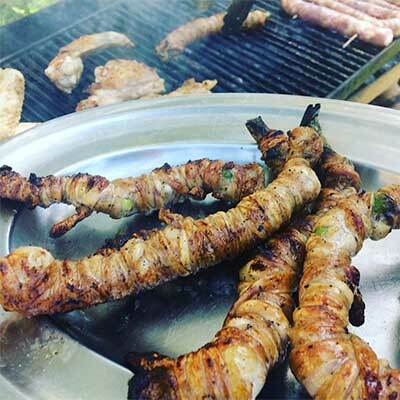 Stigghiola is a product composed of veal or lamb intestine that has been seasoned with parsley and onion and grilled. I had tripe stew in New York City once and that’s pretty close. For Sicilians, Stigghiola makes for a delightful light snack having a delicate flavor that favors socialization. Real men line up to consume this dish at any time of the night or day. The bravest of the brave love it in August too when the temperature is 100 º F. at three o’clock in the afternoon while the fat oozing out from the Stigghiola blends with the sweat oozing from their sun bronzed foreheads. Many street vendors around Palermo station their carts on the sidewalks. Hygienically uncertain, these carts and their contents appear never to have been thoroughly cleaned. If questioned, however about this, these entrepreneurs, the true connoisseurs of Stigghiola, all agree that the flavor takes precedence over hygiene and to change the conditions would be completely counter-productive. You won’t need a Google Map to find the maker or vendor of Stigghiolaro. One is to be found at every turn in Palermo. A Stigghiola stand is easily recognized by the smell-tempting cloud of smoke the hangs over them like a pall while a group of local loafers hangs about with little or nothing to do. Sfincione is one of the best Sicilian street dishes and well worth a sampling, especially if you don’t want to upset the locals who will consider you to be snobbish. 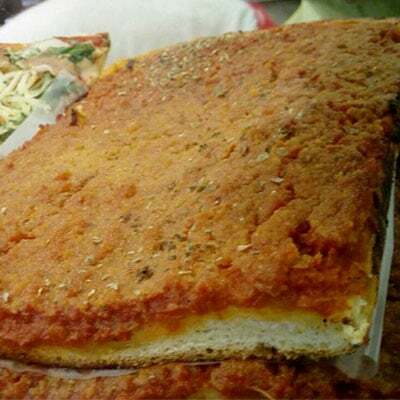 Sfincione lies somewhere in between a pizza crust and bread. This soft creation is seasoned with tomato sauce, onion, caciovallo cheese, anchovies and finally, olive oil. Although this may sound fairly heavy, it really isn’t. Problem here is that after one slice you may well find you’ve become an addict, so be warned. Sfincione is another delicacy sold all over by mobile street vendors, some of whom move about from place to place on their little three-wheel motor-bike-pickup truck aka the Ape Piaggio. Some may shout at you as you pass by but don’t be alarmed. You aren’t obligated to buy anything but if you do, prepare to become addicted. These little rascals are really delicious. All street vendors of this dish. They are to be found all over Palermo. One of the first solid foods Sicilian children eat will be Pezzi de Rosticceria and this food and its hauntingly delightful flavors combined with childhood memories will accompany a Sicilian all the rest of his or her life. As a child you eat them for breakfast. As a teenager, you eat them for a nighttime snack (they’re sold twenty-four hours a day). This helps to absorb and disguise all the many drinks you’ve illicitly had before you come home, and as an adult, it makes for a great dish to eat quickly when you have to get back to work. 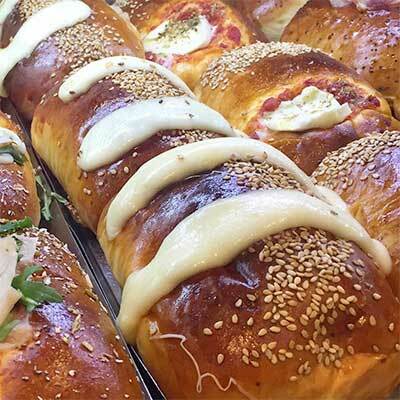 Pezzi are made of brioche dough that have been baked or fried and stuffed with various fillings. One of the more famous would be the Calzone al Forno (baked brioche stuffed with ham and mozzarella). There are sold in many cafeterias around Palermo. It’s almost laughable to watch the locals standing before a counter displaying all varieties at breakfast time. They begin by sharing one or two pieces of brioche, pretending not to want to overeat, and then finish their breakfast by sharing at least three or more half-pieces! Let me assure you that when it comes to food, not to worry. In Palermo – in all of Sicily – you’re going to see so much food you won’t know what to try next. Everywhere and at any time, you’ll gonna find something delectable to eat. I’ve listed some of the best specialties above, and I’ve also flagged some of the best places to eat. But hey! you’re only gonna stay in Palermo for a week or two, we have to narrow down our list a little. One of the best ways for you to get a sample of the real Sicilian Life in a short time is to go on a street food tour. These are organized by many of our local guides. They will take you on a tour where you’ll try our most popular dishes and nosh till you explode! If you’re a brave soul who likes to explore on your own, as I’ve always done since I was little Tano Bongiorno racing through the crowded Mercato della Vucciria with other kids, grabbing a banana here, a sausage there – I know. Very naughty. I try to make up for it now by promoting this amazing and colorful city. I can promise you that there will be no polyglot star chef with a cliché moustache ready to explain the food you are eating in a cute Italian accent. What you get instead are food peddlers that can barely speak Italian, let alone any English, and seem to have just walked out of a painting from a century ago. To put this simply, if you are the adventurous type with a strong stomach, feel free to take a tour of your own design. If this doesn’t fit your description and you can spare about three hours, try the organized tour which better describes what you are eating and what to expect. So okay, these were just seven of a never ending list of Sicilian street food dishes you will find when you wander about Palermo, but if you try any of the places and dishes I’ve mentioned, you can return home without remorse at having that gnawing feeling that you missed out on something. 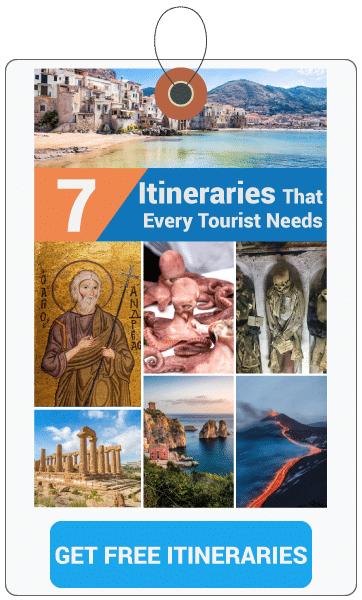 And if you have any questions about Palermo or Sicily, or if you have a great idea (my five-year old granddaughter is always running in to tell me she just had a great idea. Too smart for her own good!) just leave a comment. We won’t ignore you.